Lily Lemontree: HOW TO BEHAVE HERE, THERE AND EVERYWHERE: Excuse Me, Have You Seen My Bread Plate? HOW TO BEHAVE HERE, THERE AND EVERYWHERE: Excuse Me, Have You Seen My Bread Plate? To the young man having holiday brunch with his girlfriend's family. I could see you were uncomfortable. I am presuming that you were meeting the young lady's family for the first time and at a big holiday brunch no less. The pressure was on to set a good impression and the last thing you needed was to be embarrassed by reaching for the wrong bread plate. In the grand scheme of things, it really wasn't something to get bent out of shape about but I understand. You didn't want anything to make you more nervous than you already were and grabbing onto her grandmother's hand by accident probably didn't help matters for you. That my boy is exactly what good manners were made for, making one feel at ease in whatever environment they might find themselves in. 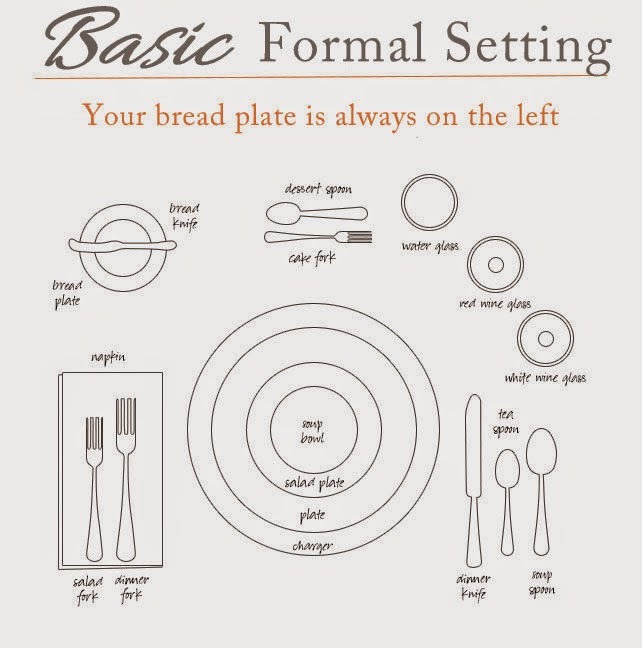 Your bread plate is always placed to the upper left of you dinner plate. if you could have only seen the expression on the poor kids face when he grabbed the grandmother's hand...priceless! LOL! Just watched the Downtown Abbey special on Manners and the proper place setting was featured. Exact measurements on precisely where each item was to be placed. A great program you might want to watch. Thank you. I still have to remind my husband, and we've been marreid 36 years! Which means I've been reminding him for 36years!